I drive by this place every morning on my way to work. I watched them working on getting the place ready to open and kept telling myself I really ought to stop in and try it out. Well, this weekend, I did. It was my treat to myself for having sold four prints. 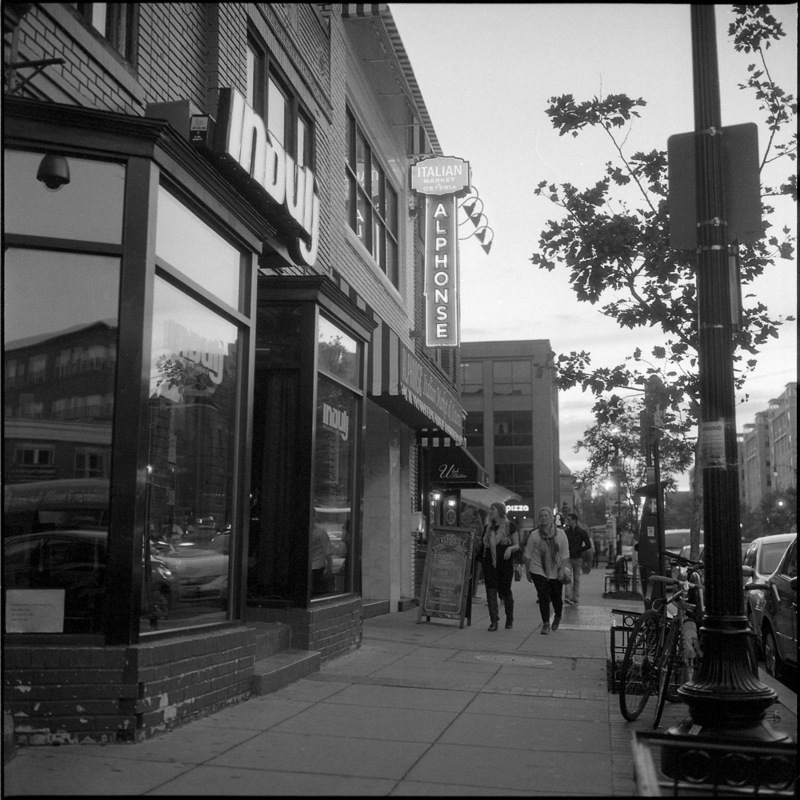 The restaurant is right on U Street, and the space is not large – they have perhaps ten tables and bar seating for another ten or so patrons. The ambiance is classic Italian eatery, down to the red checkered tablecloths and the mid-century pop and light jazz (think Sinatra, Louis Armstrong and Tony Bennett) playing at just the right volume. And most importantly, the food is FANTASTIC. I had Bronzino with roasted beets, pears and almonds, and a Valhrona chocolate cannoli that was just to die for. I will be adding this to my roster of regular haunts. Here is a streetscape including the marquee for the restaurant. 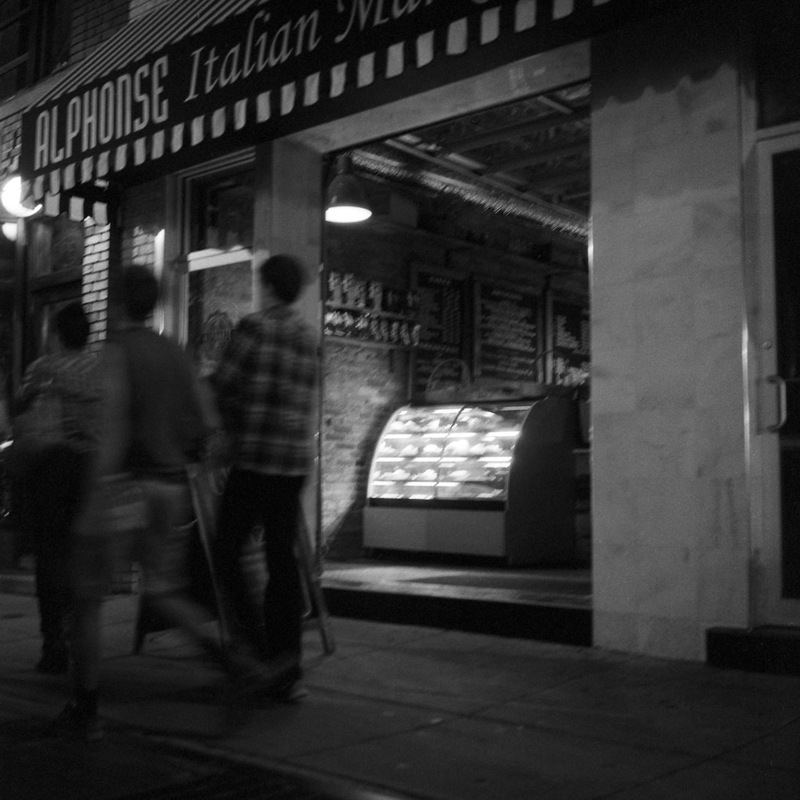 Alphonse has their own wood-fired pizza oven. One of their pizzas is next on my list of things to try. I had the Rollei with me as usual, and everyone on the staff was particularly appreciative of it. 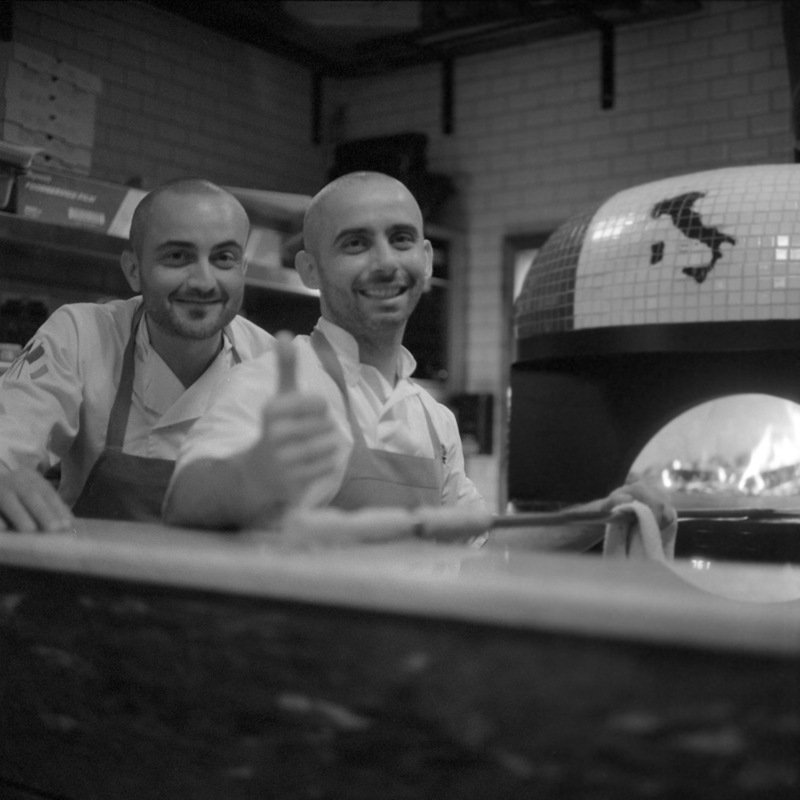 I was trying to take a shot of the pizza chefs working at the oven, but one of them caught me out of the corner of his eye, turned, and they both mugged for the camera. This is the view of the restaurant from my table in the back by the pizza oven. As you can see, it’s a long, narrow space, but with charming atmosphere. The front of the restaurant has a small shop where you can buy desserts and Italian specialty grocery items like salamis. With the sun down, the ambient light outside is pretty much equal to the illumination inside, which means that with the Delta 3200 film loaded in my camera that I was shooting, I could hand-hold pretty much equally well inside and out. You can see this in the shot of the market door – there is no brightness difference (and no manipulation of the image to equalize the brightness level between inside and out). As many of you know, I like walking around my neighborhood with the Rollei on my neck, photographing what I find. 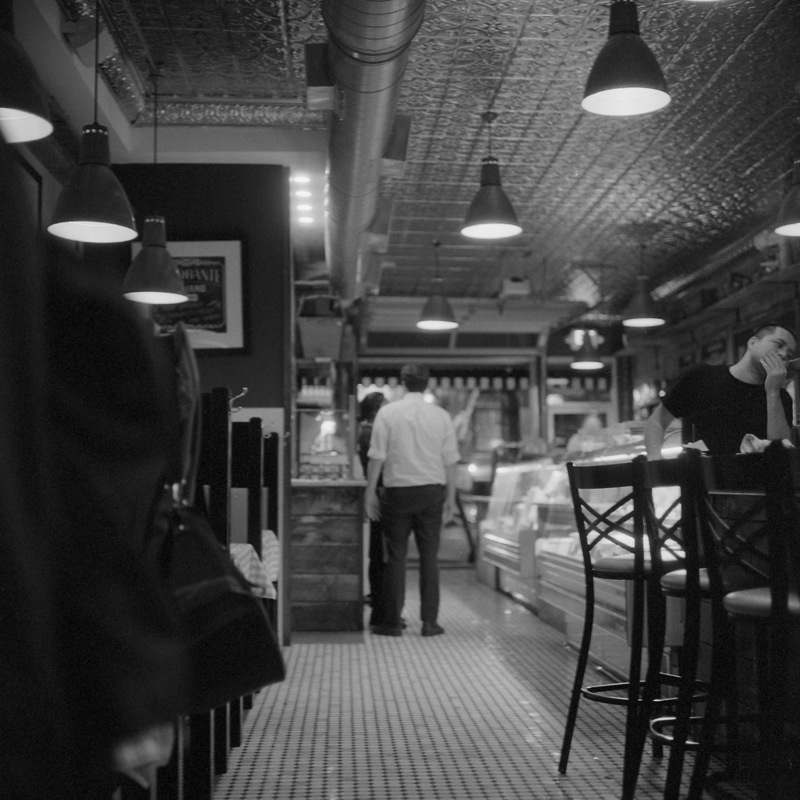 I went out this past weekend to put some Ilford Delta 3200 through the camera, to test how it performs as a low-light film. I wanted to shoot some interiors and some street scenes in low light, hand-held. Ilford Delta 3200 is really the last man standing in this game, as Kodak has discontinued their Tmax 3200 in any size, and even when available, it was only available in 35mm. I was out to meet a customer who was interested in my photography – I made a print sale! (that will be a different blog post). In celebration, I was out exploring the neighborhood and took a different route home and came by this (relatively) new coffee shop, simply named, “The Coffee Bar”. It’s very cute inside, and they serve a really tasty chai. They did a fantastic job renovating the place and gave it a very inviting atmosphere. 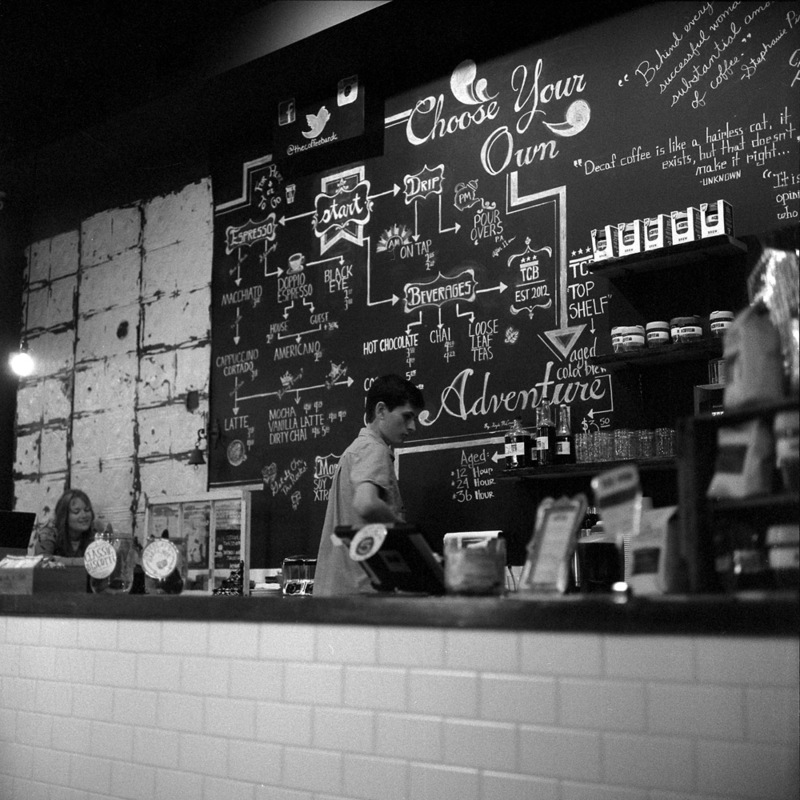 I love the sayings on the chalkboard menu – “decaf coffee is like a hairless cat – it exists, but that doesn’t make it right”. One of the things that happens when you test out a new film is that you discover character quirks that help you decide how and when to include it in your palette of options. 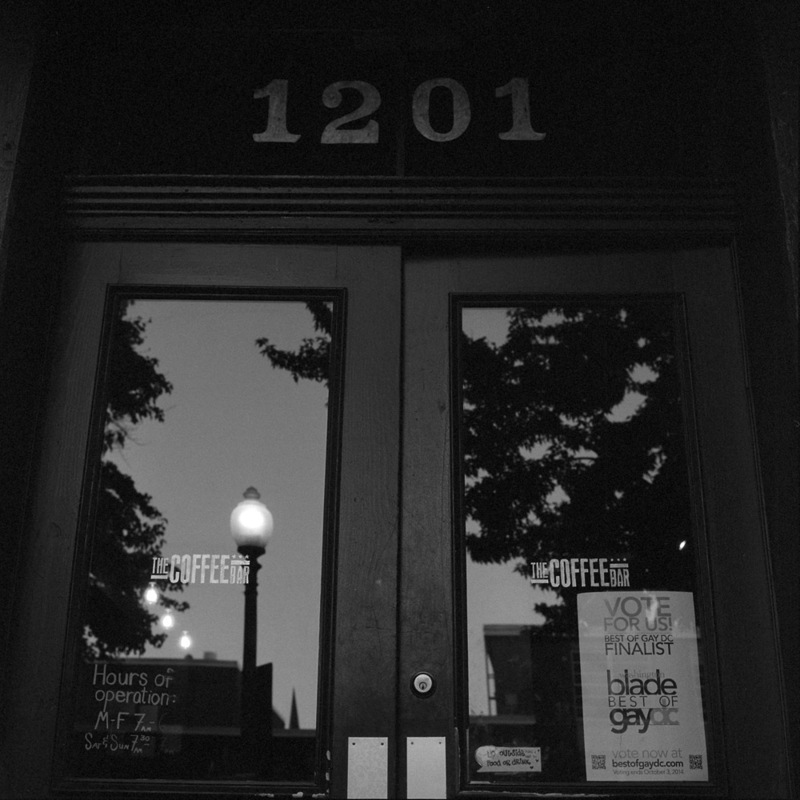 Delta 3200 is a high-speed yet (at least in 120) relatively fine-grained film. Since my Rollei has a top shutter speed of 1/500th of a second, the film’s speed severely curtails my ability to use it in daylight situations. In low light, though, that vice becomes a virtue and I can hand-hold photos that I would ordinarily need a tripod for. That was, as Donald Rumsfeld would have put it, a “known known”. A characteristic I did not know until I actually developed the film was that apparently Delta 3200 does not have an anti-halation coating. Anti-halation coatings prevent ‘blooming’ in highlights that give a “glow” to light sources within a scene. When you don’t want that, having it can be bad. However, in a scene like this, it really works and gives a warm atmosphere to the scene. This is a shot that I think when I make a silver-gelatin enlargement of it, I’ll sepia-tone the print to give it that extra warmth, and give it a real ‘coffee’ atmosphere. The doors to The Coffee Bar were catching the last blush of sunset in the sky, and the reflection of the street lamp just starting to glow in the twilight. I love this kind of light at this time of day, where the sky is dimming to be just as bright as the landscape below. This is one shot where I wish I had the second Rollei with me and some color film loaded, as I would have liked to capture the deep blue sky, the patina’d green lamppost, and the orange glow of the street lamp globe reflected in the window, the gold leaf of the street number and ‘The Coffee Bar’ on the glass twinkling in the sun’s last rays. 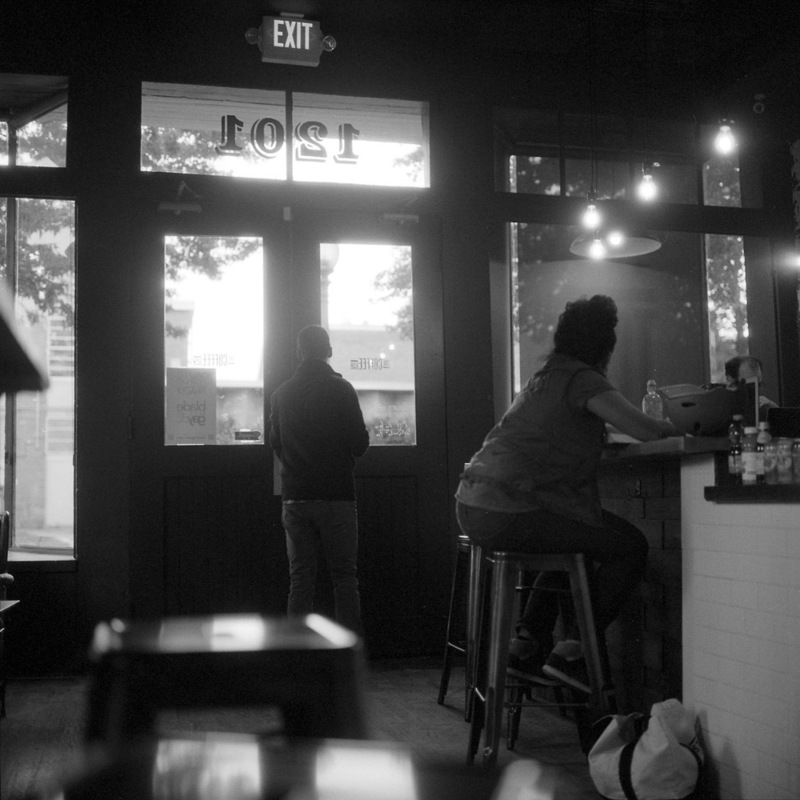 Another time – I know where it is, and I can always go back in for a good chai to warm me up on a chilly fall evening. This didn’t really ‘fit’ with any of the other neighborhood photo groups I posted earlier, so it’s getting its own post. 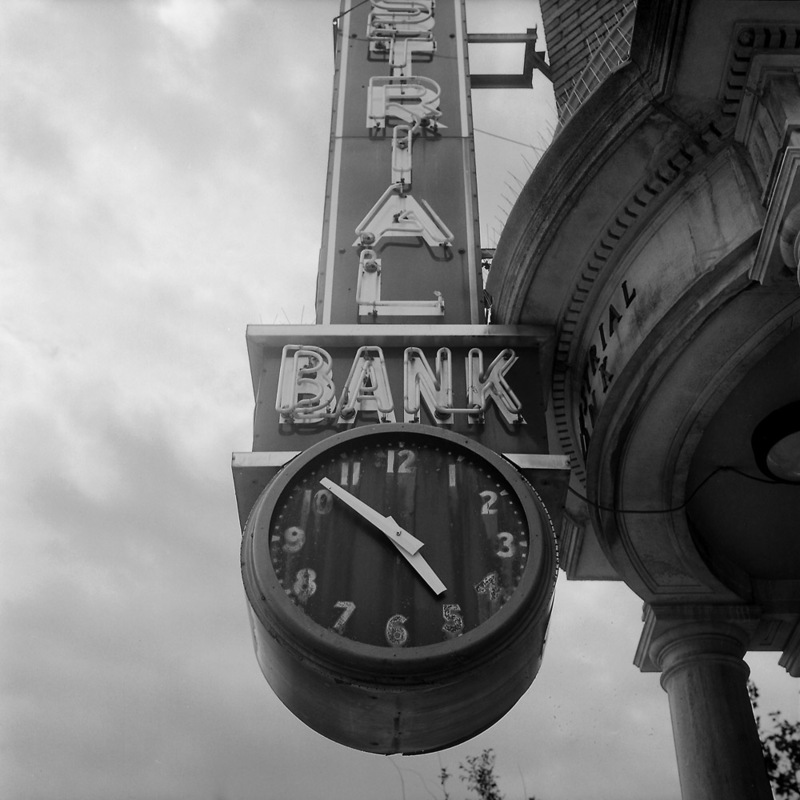 The Industrial Bank branch at 11th and U Streets NW is the original location for Industrial Bank, which was founded to cater to the African-American community in the early 20th century when many mainstream banks wouldn’t lend money to black people. They have kept the vintage neon sign with the clock outside, probably a 1930s addition from the look of it. They never light the neon, though. The clock does work, but nobody seems to be bothered enough to get the time right. When I took this shot it was around 1pm, but the clock says a bit shy of 5pm. But hey, it’s 5pm somewhere!